It's not hard to decorate cute cupcakes for a special person's birthday or celebration. 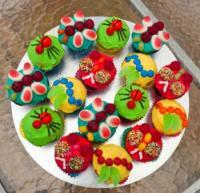 Cupcakes are a favorite dessert of adults and kids alike, and they're easy to customize to any season or occasion. While it can be very time-consuming to make, prepare, and decorate a large layer cake, it's normally much faster to bake and decorate a batch of cupcakes. Their small size and domed tops make them easy to ice quickly, and decorations can range from a simple silver dragée on top to very intricate fondant or gum paste designs. If you're planning anything more complex than piping on some frosting and sprinkling luster dust or sugar on your cupcakes, it's a good idea to draw out your designs beforehand so that you can collect the equipment you need and work from your template. First, decide which type of frosting you'd like to use. 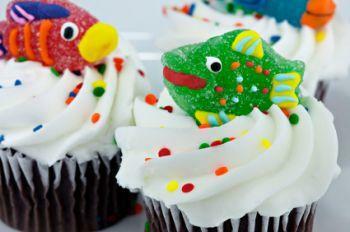 You can use buttercream, fondant, ganache, or any other type of icing to top your cupcakes. Most decorators find buttercream to be the easiest frosting to pipe and prepare, and it's simple to decorate cute cupcakes with just a colorful swirl of buttercream from a pastry bag and tip. Try inserting a large star tip into a pastry bag, filling the bag halfway with frosting, and piping around the cupcake until you've applied the amount of frosting you want. You can then top the cupcake with sprinkles, small candies, cake toppers, or fondant decorations. Alternatively, it's an elegant look to frost cupcakes with just one buttercream swirl and serve them like that. Cover cupcakes with fondant by applying a thin layer of buttercream to the top of the cupcakes. Roll out the fondant, and use a drinking glass or a sharp knife to cut small circles from it. "Glue" the circles to the top of the buttercream, and slice off any overhanging edges. Fondant coated cupcakes are sleek and can be topped with small fondant flowers or other figures. Cupcakes that are topped with ganache may not always look as visually appealing as those topped with other frostings, but they're a perfect choice for chocolate lovers. While ganache is still moist, just before it thickens, scatter edible glitter, colored sugar granules or sprinkles, or luster dust on its surface. Top with a few dragées for an even more dramatic effect. Tailor your cupcakes to the occasion for which you're decorating. For example, if you're making cupcakes for a girl who likes horses, you could coat each cupcake with a circle of white fondant and a gray fondant horseshoe. Don't be afraid to use add-ons! Sprinkles, dragées, candies, chocolate chips, dried fruit, and other edible treats can all be used to enhance a decorating idea and add to the cupcake's texture. If you have a pastry bag and tips, use them to make buttercream flowers, rosettes, script, or patterns on your cupcakes. Serve your cupcakes in an interesting way. Stack them as part of a multi-layer cupcake cake, or serve them on the different levels of a cupcake tree. Any visual interest is always a plus. Even if you don't have any special cake decorating equipment or pastry bags and tips, you can still make beautiful cupcakes. Tint your icing if you'd like, then apply it carefully with a spatula or butter knife, and sprinkle granulated sugar on top before you serve. Consider especially creative or unique designs for your cupcakes. If they don't turn out the way you intended, they'll still taste good!